This easy-to-use, fast-moving tutorial introduces you to functional programming with Haskell. You will learn how to use Haskell in a variety of practical ways, from short scripts to large and demanding applications. 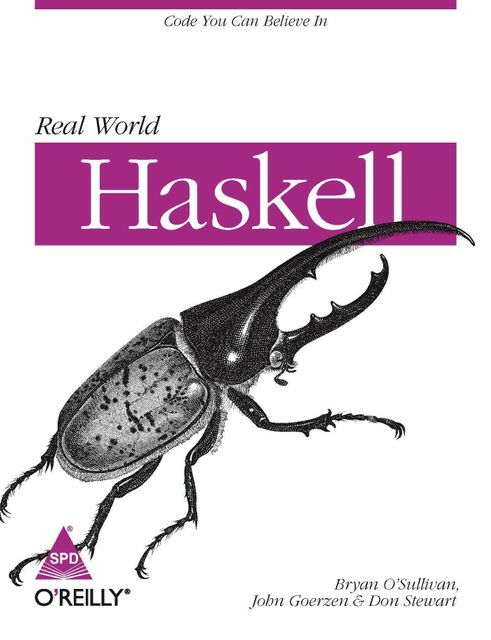 Real World Haskell takes you through the basics of functional programming at a brisk pace and then helps you increase your understanding of Haskell in real-world issues like I/O, performance, dealing with data, concurrency and more as you move through each chapter. Understand the differences between procedural and functional programming. Learn the features of Haskell and how to use it to develop useful programs. Interact with file systems, databases and network services. Write solid code with automated tests, code coverage and error handling. Harness the power of multicore systems via concurrent and parallel programming. You'll find plenty of hands-on exercises, along with examples of real Haskell programs that you can modify, compile and run. Whether or not you've used a functional language before, if you want to understand why Haskell is coming into its own as a practical language in so many major organizations, Real World Haskell is the best place to start.